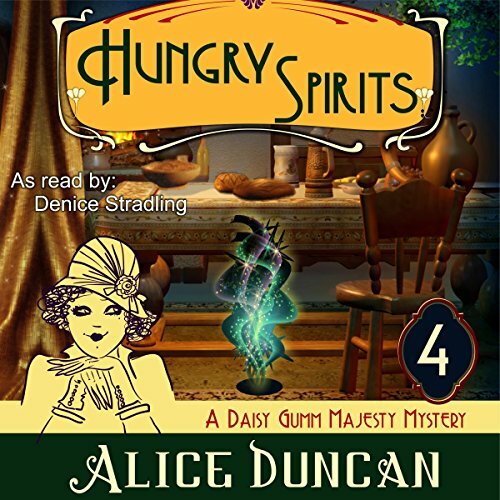 When Daisy Gumm Majesty, spiritualist to people with more money than sense, is asked by her good friend, Johnny Buckingham, a captain in the Salvation Army, to teach a cooking class for disadvantaged ladies, she's sure Johnny is nuts. She earns her living raising the dead, for goodness sake! The only thing she's ever been able to do in the kitchen is burn things. Yet, she gallantly sets out to teach the class, using a cooking booklet Johnny provided, fully expecting calamity to ensue. When it does, the only surprise is that it's not cooking-related. Rather, one of her students vanishes before the class is over. In getting to the bottom of the mysterious disappearance, Daisy is not only forced to confront her own prejudices about Germans, whom she blames for her husband's ill health, but she also lands smack in the middle of a criminal plot! In short, Daisy's in for the adventure of her life. I read this book years ago & was so enchanted with Daisy, but I could never find more books in this series. So imagine my delight to find the audio books! Daisy Gumm Majesty is one of my favorite characters. Her wit, and her kindness towards her invalid husband, make her the kind of woman I want to befriend. This book was humorous because Daisy teaches a cooking class at the Salvation Army. This is because she has no ability to cook. But solving mysteries regarding illegal immigrants, now that's another story.